"Defendant testified that he was specifically authorized in advance of the meeting to disclose the key judgments of the classified NIE to Miller on that occasion because it was thought that the NIE was 'pretty definitive' against what Ambassador Wilson had said and that the vice president thought that it was 'very important' for the key judgments of the NIE to come out," Mr. Fitzgerald wrote. Just a small point. Cheney's judgment in this matter is extremely odd. Who really cared about Joseph Wilson's op-ed? Why the extreme defensiveness and then recklessness of the Plame leak? We're either talking extreme hubris here, or someone who felt he had a lot to hide. Or an admixture of the two. Okay, now it's official. The White House's line is that if the president leaks classified information or tells someone to leak classified information, then it's automatically declassified. No harm, no foul. 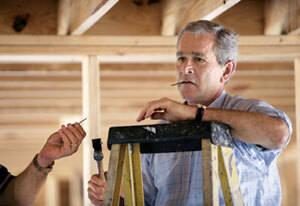 Bush: When I do it, it's not a leak. Shorter Bush: I can do anything I want.